Kenneth Paul Block, Cover of catalogue for exhibition, 1999. Private Collection. 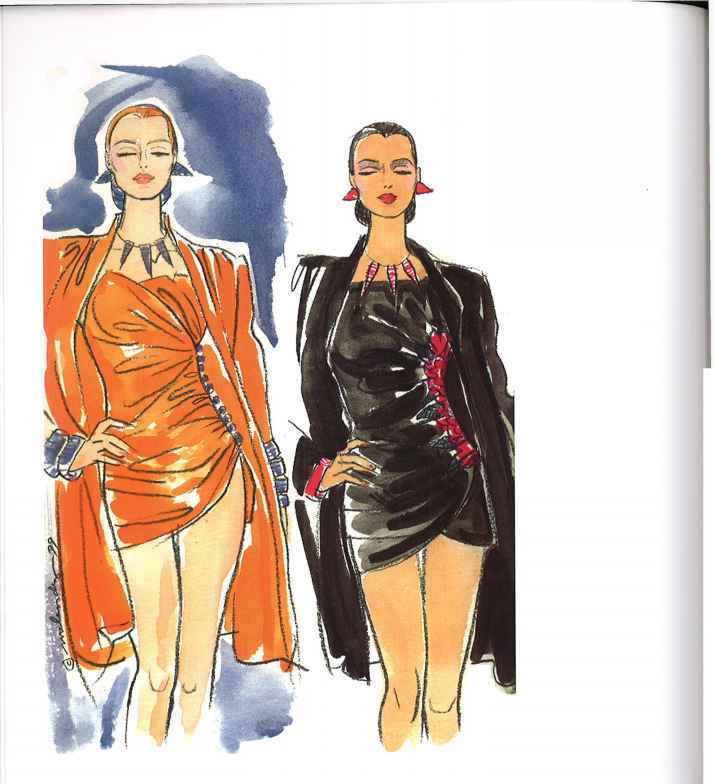 Trained at Parsons School of Art and Design, New York, Kenneth Paul Block was the best known of the illustrators at WWD. His career spanned the period when fashion illustration was under threat and he is considered to be pivotal in its eventual survival. 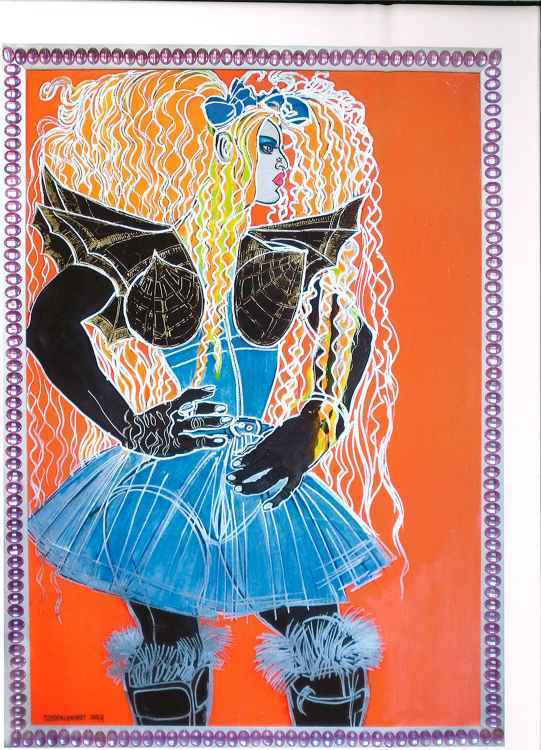 Michael Roberts, Azzedine AlaVa, 'Sphinx dress', for The Sunday Times, March 1990. Paper collage. Courtesy Artist's Collection/Maconochie Photography. Michael Roberts' ironic style is mediated through the laborious technique of paper mosaic collage. An iconic stylist, photographer and fashion editor, he creates illustrations that are uniquely daring and reflect his own individuality. 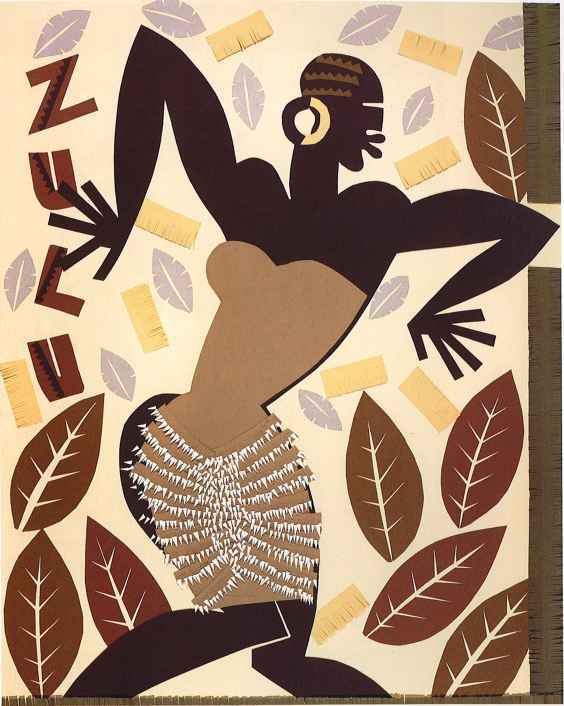 Michael Roberts, Azzedine Alaia, 'Fringed skirt', for The Sunday Times, March 1990. Paper collage. Courtesy Artist's Collection/Maconochie Photography. The Tunisian designer Azzedine Alaia, known as 'the king of cling', uses Lycra, leather and zips to create body-hugging designs that are simultaneously provocative and elegant. 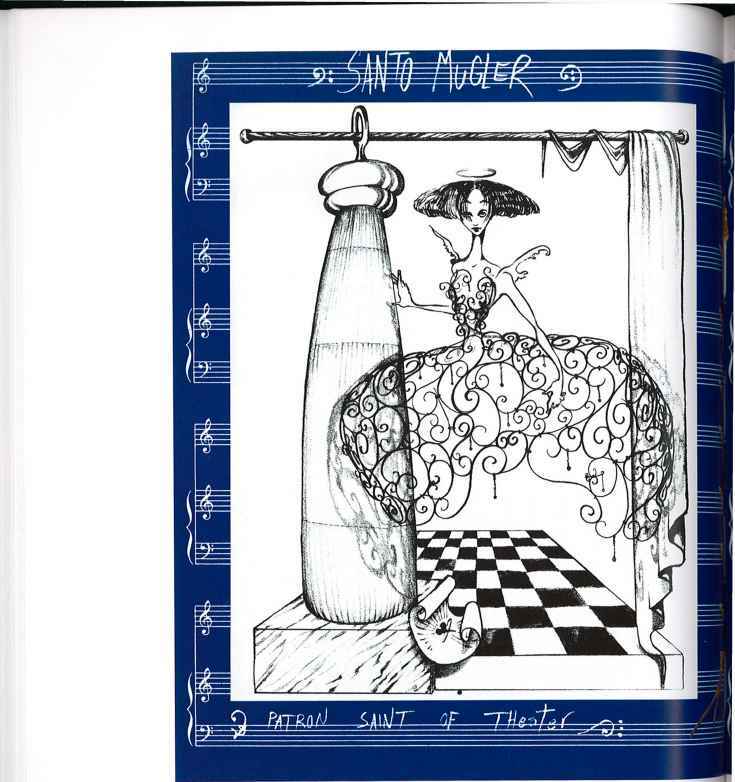 Ruben Toledo, 'Sonto Mugler' and 'Santo Alai'a', Visionaire, 'Heaven' issue, December 1991. Courtesy Visionaire. 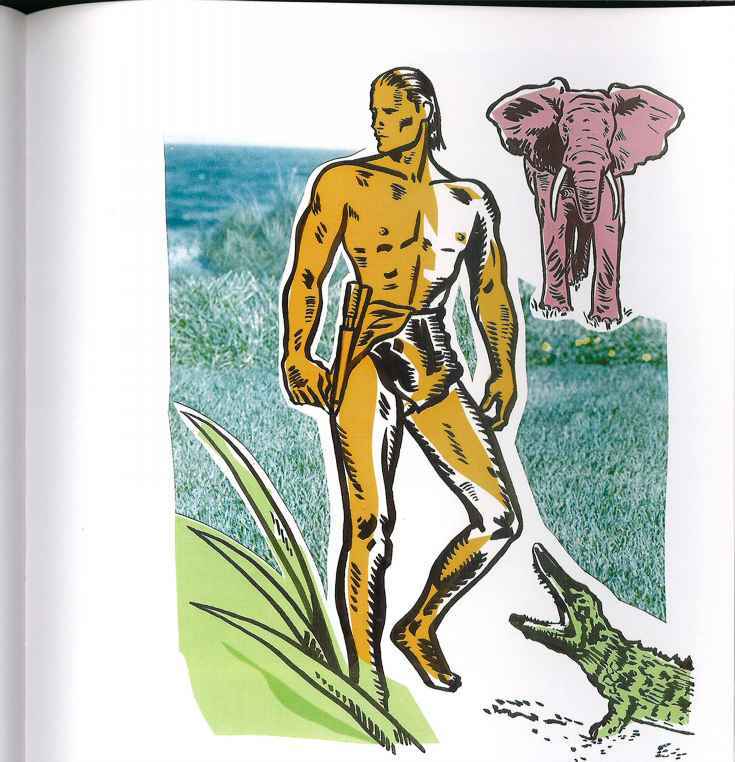 Visionaire, launched in 1991, publishes three themed issues a year and continually pushes the boundaries of illustration. The 'Heaven' issue contained images elevating designers to the status of sainthood. 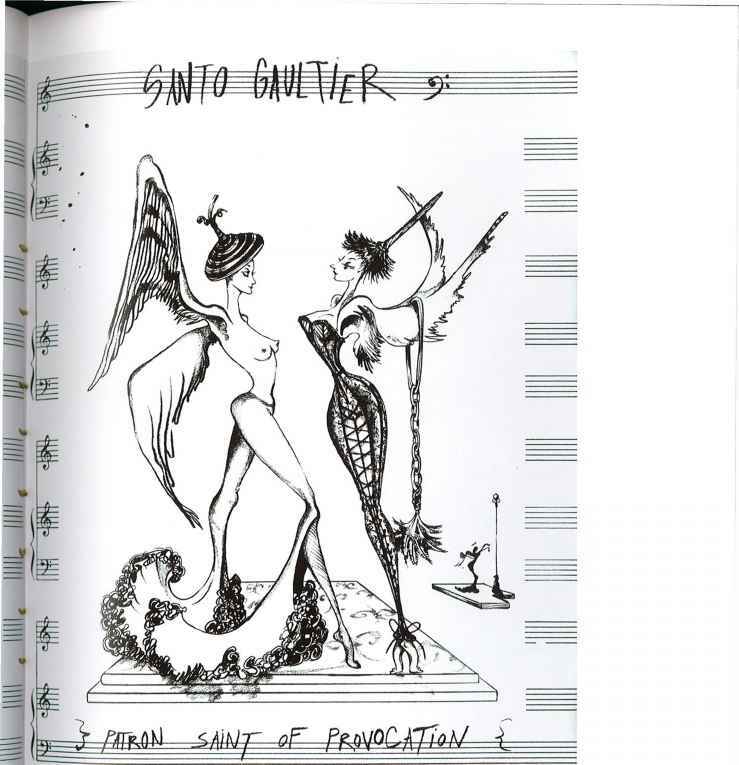 Ruben Toledo, 'Santo Gigli' and 'Santo Gaultier', Visionaire, 'Heaven' issue, December 1991. Courtesy Visionaire. Using a different style from his watercolours, Toledo's spidery drawings demonstrate his versatility in all types of media. 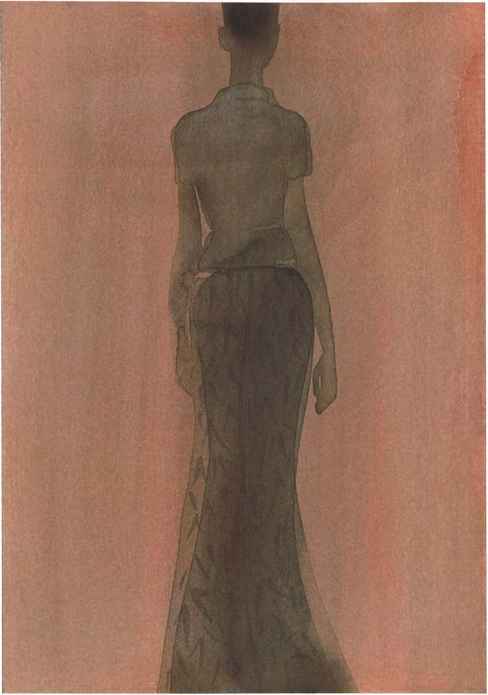 Steven Stipelman, Evening gown tor Women's Wear Daily, 1991. Artist's Collection. A white, cloud-like evening gown floats against a dark ground in Stipelman's 'mood' illustration. Ruben Toledo, 'Under the Veil'. Original illustration for Vogue Nippon, 1992. Watercolour on paper. Artist's Collection. Isabel Toledo's Under the Veil collection featured mermaid-like sheath dresses in velvet and silk chiffon. ZOLTAN+, Christian Dior for Comité Montaigne/French Vogue, 1992. Artist's Collection. At this time Gianfranco Ferre was head designer at Christian Dior. Zoltan often used, as he does here, a combination of illustration, collage and photography. ZOLTAN+, Cartier for Comité Montaigne/French Vogue, 1992. Artist's Collection. Founded in 1847, the Maison Cartier has remained at the forefront of luxury jewellery, perhaps best known for its animal designs, such as this panther in platinum, diamonds and sapphires. 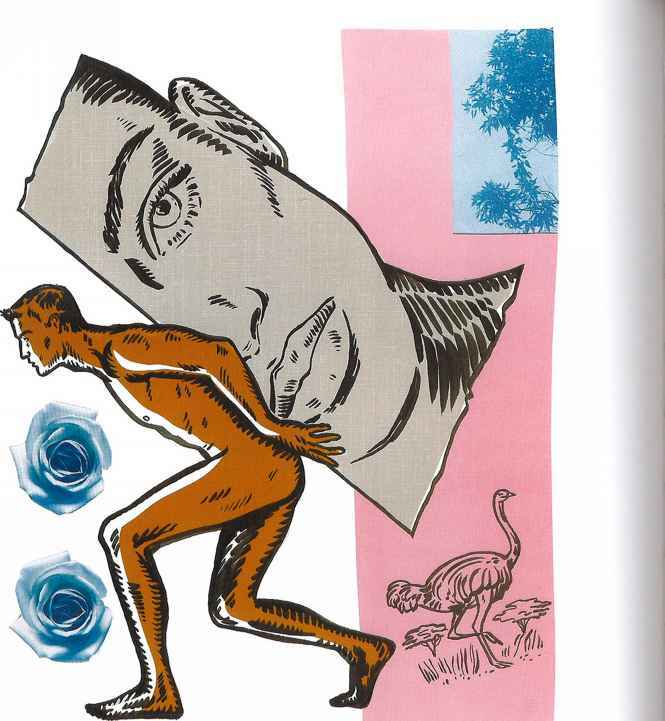 Patrick Arlet, Orignal illustration for Marie Claire France, c.1992. Oil on paper. Courtesy Galerie Bartsch & Chariau, Munich. 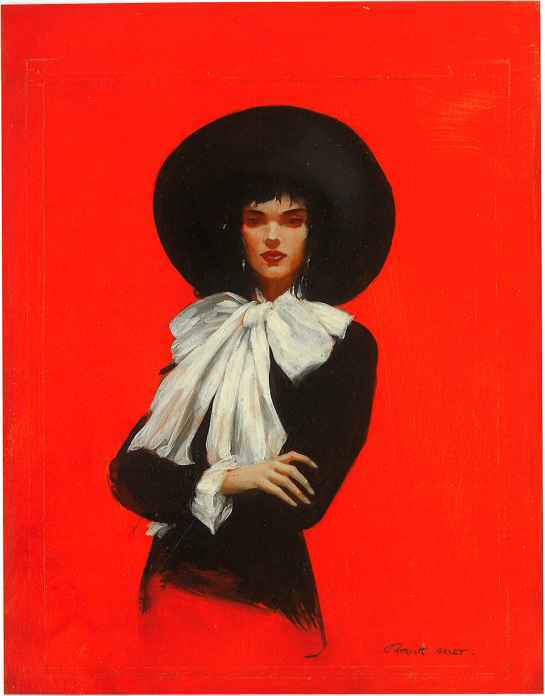 A face-framing hat and bow cravat feature in Arlet's dramatic illustration. Patrick Arlet, Rifat Ozbek. 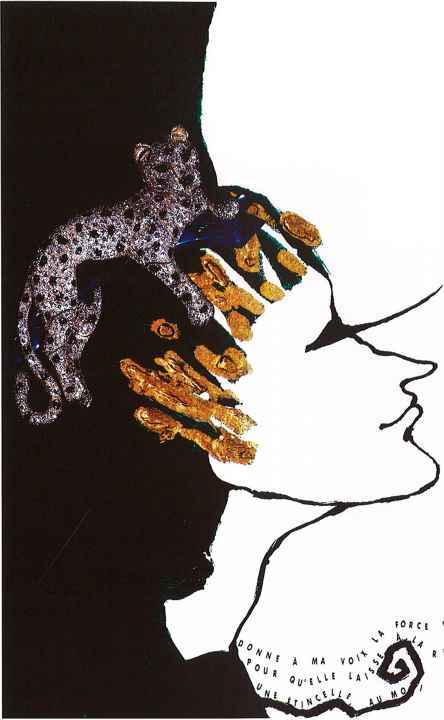 Original illustration for Marie Claire France, c.1992. Oil on cardboard. Courtesy Galerie Bartsch & Chariau, Munich. Rifat Ozbek clothes the 'modern nomad', drawing inspiration from his own (Turkish) cultural heritage, from other ethnic textile and decorative traditions, and from the London club scene. Here the formality of a tailcoat is contrasted with a man's shirt and track pants. Gladys Perint Palmer, Vivienne Westwood, Winter 1991/2, tor Grazia Italy, November 1991. Mixed media on paper. Courtesy V&A Images. A black leather cropped jacket, platform thigh boots and suspenders continue Westwood's exploration of fetish wear. 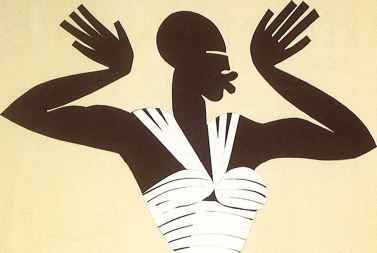 Gladys Perint Palmer has done illustrations for all the major fashion magazines and for many designers' campaigns. She has exhibited widely and is currently Executive Director of Fashion at Academy of Art University, San Francisco. Gladys Perint Palmer, Vivienne Westwood, Winter 1993. Mixed media on paper. Courtesy V&A Images. Palmer brings a lively humour to her work, capturing the essence of Westwood's anarchic Anglomania collection, v/hich gave a distinctly contemporary flavour to traditional Scottish textiles such as mohair tartan and Argyll knit. The outrageously high platform pumps complete the sartorial pun. Jean-Philippe Delhomme, Campaign for Barneys, New York, 1993. Artist's Collection. 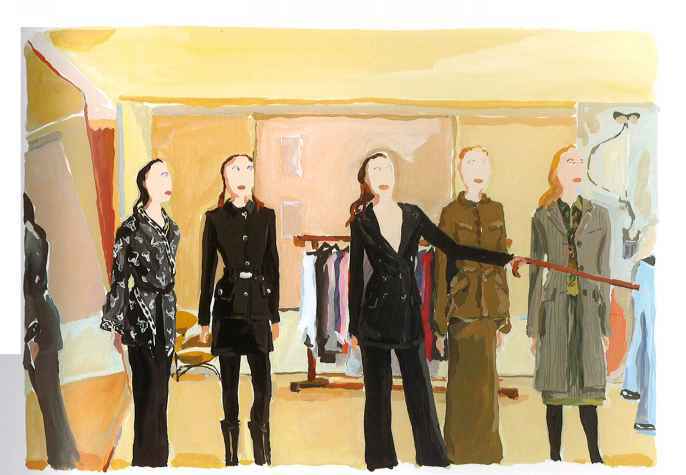 Since the early 1980s, Jean-Philippe Delhomme's work has been published in many magazines and used in promotional material for, among others, Barneys, New York's cutting-edge department store. Jean-Philippe Delhomme, Campaign for Barneys, New York, 1994. Artist's Collection. Known for his charmingly witty takes on the fashion world, Delhomme also makes animated films. 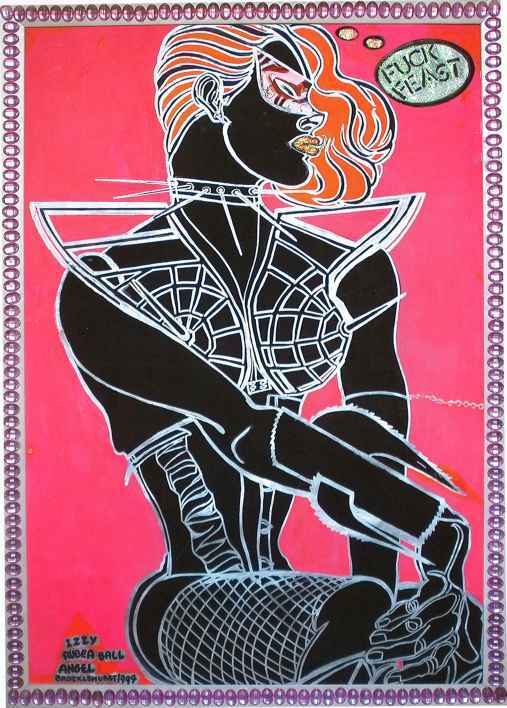 Jo Brocklehurst, Izzy in club wear, early 1990s. Mixed media. Artist's Collection. An outfit of body armour called 'Way of the Wyrd', made by Anthony Gregory out of a steel framework, worn over a Lycra bodysuit at the 'Rubber Ball', an annual celebration of fetish wear at Hammersmith Palais, London. Jo Brocklehurst, Rasta Mary in club wear, 1994. Mixed media. Artist's Collection. 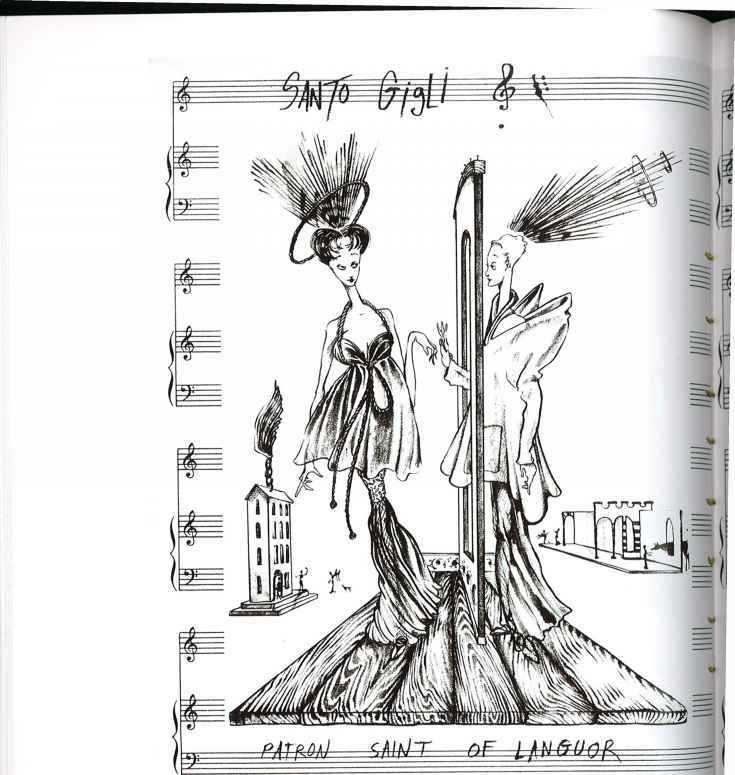 Brocklehurst's dazzling drawing of Rasta Mary in her outfit for the 'Rubber Ball' (see opposite). Mary was the manageress of Boy, a boutique in the King's Road, London, which supplied a mix of secondhand and glam rock club wear. François Berthoud, Chloé, 1994. Linocut and monotype. Courtesy Galerie Bartsch & Chariau, Munich. A filigree silhouette epitomizes Berthoud's combination of delicacy and strength. François Berthoud, Wire dummy, 1994. Linocut and monotype. Courtesy Galerie Bartsch & Chariau, Munich. 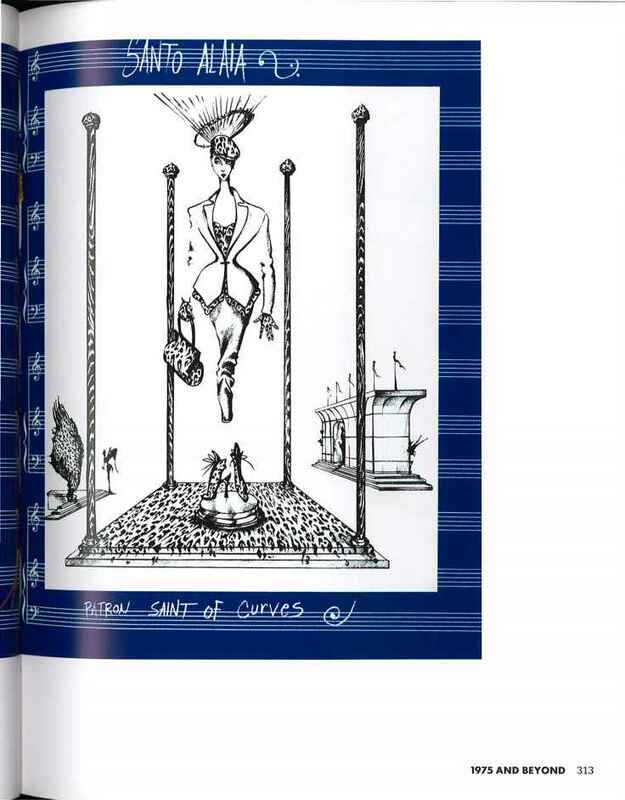 Perhaps in an ironic comment, Berthoud's wire dummy expresses the ultimate emptiness of the world of fashion, but also references Jean-Paul Gaultier's 1989 'Wedding Cage' dress. 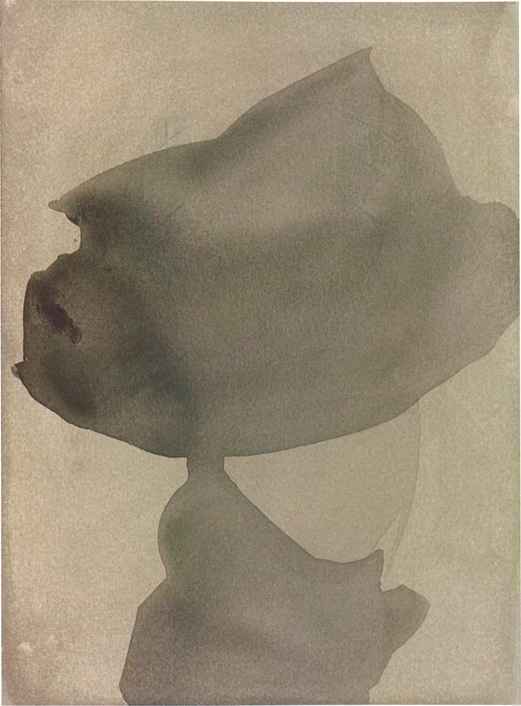 Robert Passantino, Mon with Head. Original illustration for the Daily News Record, 1994. Brush, acrylic, ink and collage. Artist's Collection. In a special article on men's toiletries, Passantino combines collage and painting. Robert Passantino, Tarzan. Original illustration for the Daily News Record, 1994. Brush, acrylic, ink and collage. Artist's Collection. Men's cosmetics have become big business and here Tarzan looks exceptionally well groomed. Kareem lliya, Ann Demeulemeester for Visionaire, 'White' Issue, 1994. Artist's Collection. One of the 'Antwerp Six', Demeulemeester is a deconstructionist who layers and drapes textured and antiqued fabrics, sometimes with raw edges, into a subtle mix of couture and subcultural elements. Lebanese-born lliya is a graduate of the Fashion Institute of Technology, New York, and has concentrated on illustration since 1992. Using a bleeding technique, he creates halos of suffused colour on and around his subject. Steven Stipelman, Black dress, 1996. Artist's Collection. Continual experimentation and exploration of different types of media are vital for the development of an artist's work. In this personal (rather than commissioned) work, Stipelman conveys the effect of layers of sheer, spotted fabric. 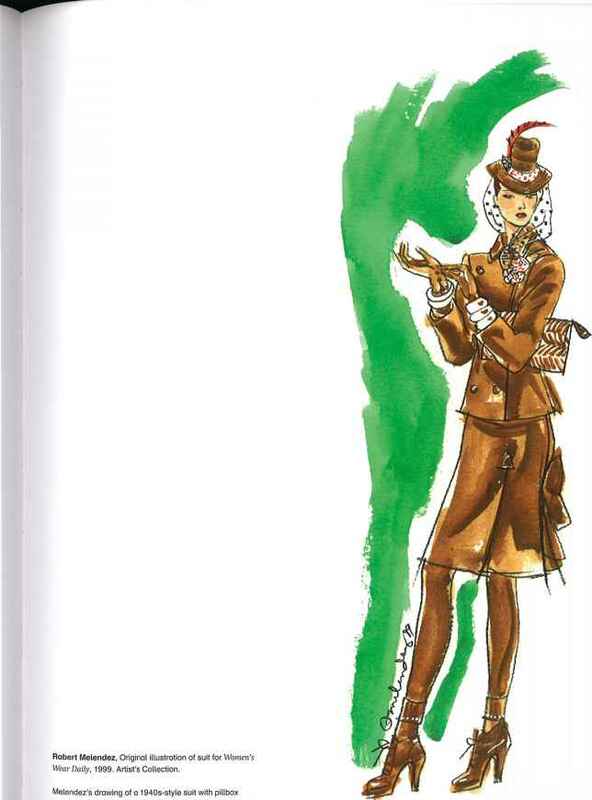 Mats Gustafson, Original illustration of Prada for Italian Vogue, 1997. Watercolour. Artist's Collection. 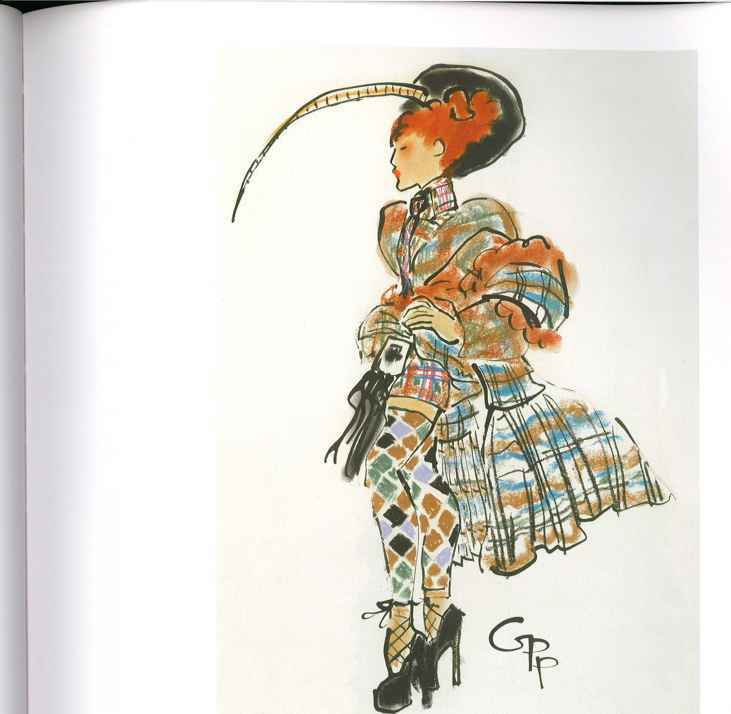 Since the late 1970s, Mats Gustafson, who trained as a costume designer at the Scandinavian Drama Institute, Stockholm, has had his work published in all the major fashion magazines. 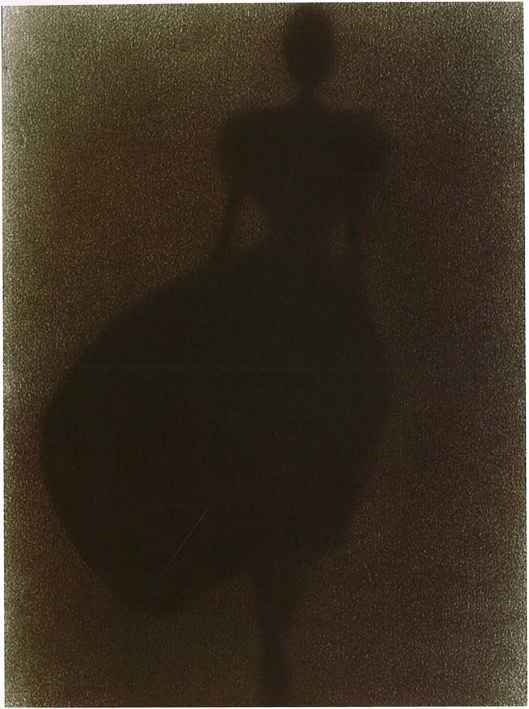 His diffused, shadowy images create an atmosphere and mood that are unique. Transforming an old family firm into a global conglomerate, Miuccia Prada has established a reputation for understated clothes and accessories that are immediately recognizable to the fashion cognoscenti. 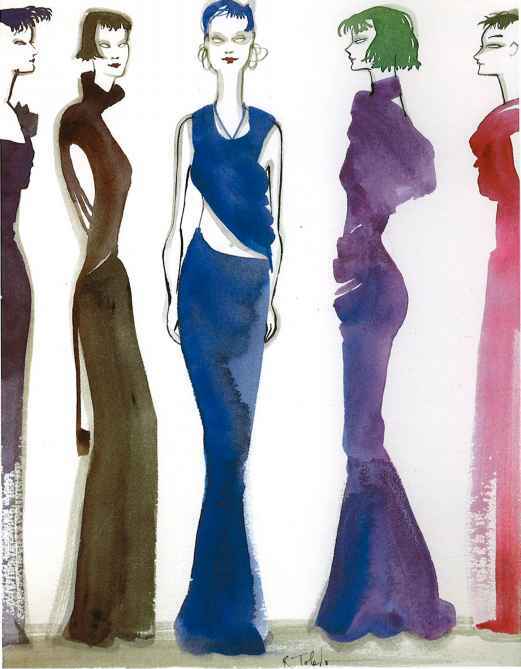 Mats Gustafson, Original illustration of Comme des Garçons for Italian Vogue, 1997. Pastel and chalk. Artist's Collection. Rei Kawakubo founded Comme des Garçons in Japan in 1969 and began showing in Paris in the early 1980s. Her work is distinguished by its warped asymmetry, distressed fabrics and monochrome palette. 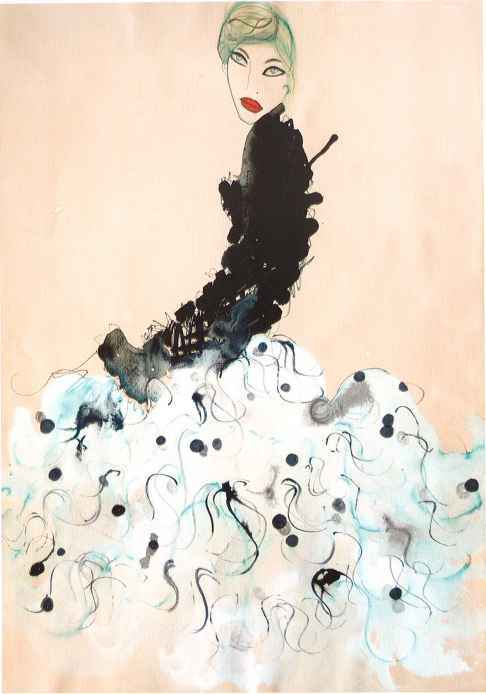 Mats Gustafson, Original illustration of Yohji Yamamoto for Vogue Nippon, 1998. Watercolour. Artist's Collection. 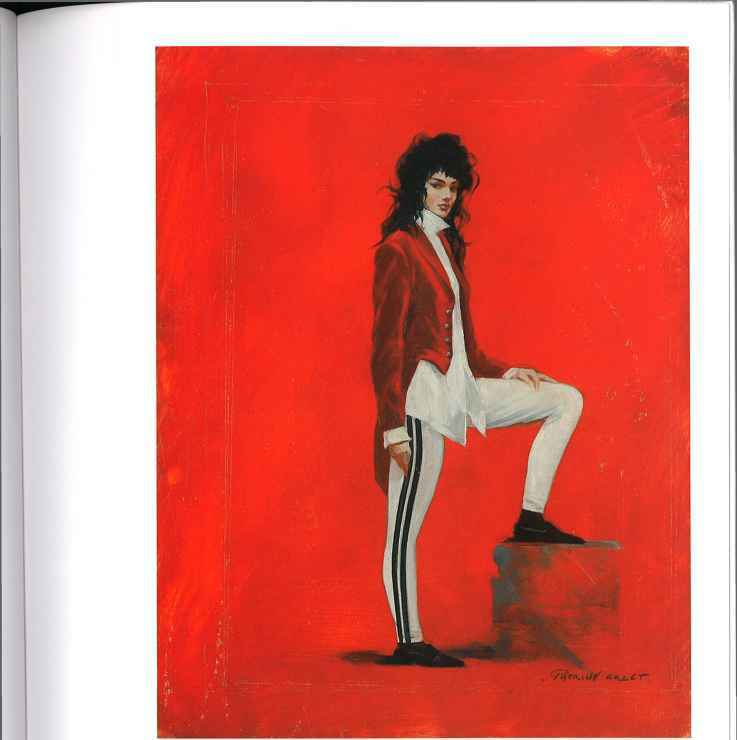 Mats rarely gives his fashion models a visual identity, though this did not prevent the Council of Fashion Designers of America from commissioning him to do a series of portraits of designers honoured by them. Ruben Toledo, 'Black Magic from Cuba'. Original illustration for French Vogue, 1997. India ink and watercolour on paper. Artist's Collection. Inspired by a trip to Cuba, Toledo uses black models to show asymmetrical necklines and handkerchief-point hemlines in contrasting colour. Ruben Toledo, 'Mug Shot Lineup'. Original illustration, 1998. Watercolour on paper. Artist's Collection. Fabric wrapped and draped around the torso softens the line of the hobble skirts. Ruben Toledo's illustration was used for a poster advertising a retrospective exhibition of the work of his wife, Isabel Toledo, at the Fashion Institute of Technology, New York. 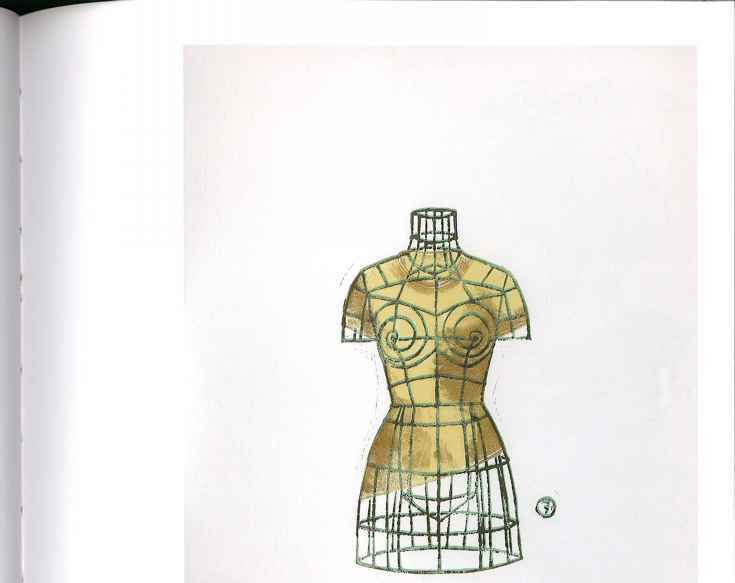 Robert Melendez, Original illustration of swimwear for Women's Wear Daily, 1999. Artist's Collection. Trained at Parsons School in New York, Melendez imbues his swimwear with glamour and glitz in a promotional calendar. 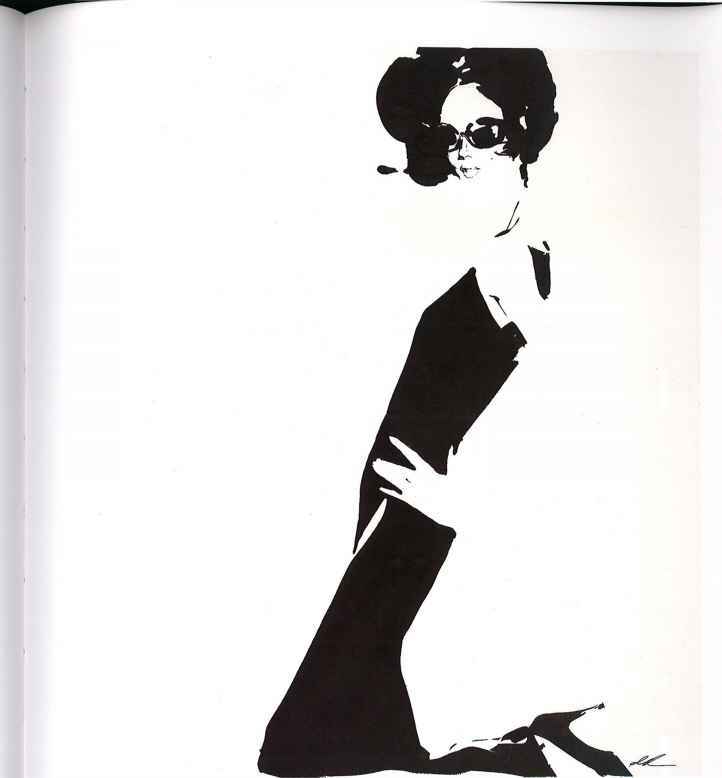 As well as WWD, he illustrated for the New York Times, the Daily News Record and Saks Fifth Avenue from the 1970s. hat and veil combines accurate detail with wit and attitude. David Downton, Valentino, 1999. Black ink and oil pastel on red paper with acetate overlay. Artist's Collection. David Downton, who trained in graphics at Wolverhampton Art College, UK, is one of the best-known British fashion illustrators working today. While paying homage to the great names of the past, such as Gruau, Bouché and Eric, he injects his painterly work with modernity. 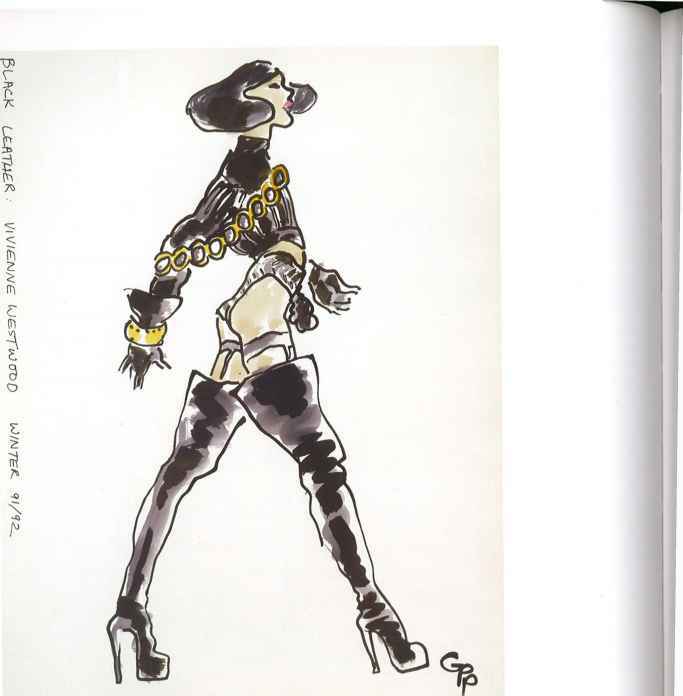 David Downton, Jean-Paul Gaultier, 1999. Black ink on paper. Artist's Collection. A slim, black sheath dress by Gaultier, is given extra glamour by the addition of 'Jackie O' sunglasses. 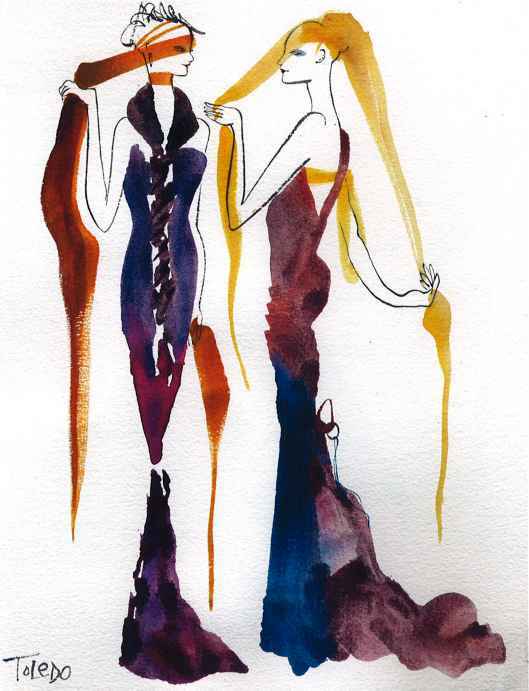 Tanya Ling, Original illustration for US Hlle Trend Report, Fall/Winter 2000. Mixed media on paper. Artist's Collection. Forecasting future trends is an important facet of the fashion industry, and by its very nature is most suitable for interpretation through illustration. Here, Tanya Ling, an artist and designer who has gone on to specialize in illustration, depicts a dress with black bodice and frothy, dotted skirt.